Fluoride is a natural mineral that can be found in several foods and water sources, and its presence is good news for your child’s growing smile – studies have shown that people who grow up drinking fluoridated water tend to experience less cavities and have stronger teeth overall than those who don’t. This is because fluoride is slowly concentrating in the growing bone of your child’s tooth structure, hardening the enamel on both baby and adult teeth. 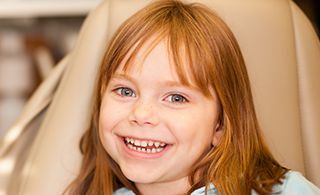 At Pediatric Dentistry of Prospect, Dr. Danielle strongly recommends that your son or daughter receive fluoride treatment as a part of their regular appointments, and our team can also recommend fluoridated oral hygiene products (such as toothpastes and mouthwashes) for regular, beneficial use at home. Our Prospect, KY team wants to help your loved one’s smile stay strong and happy for many years to come. Please contact us right away if you have any questions, or if you’re ready to schedule a first visit! We welcome new patients from Beachland Beach and surrounding areas.